Chances are, if you're a Bobby Conn fan, you've already heard of 'Maraconi'. It appeared on Conn's 2012 album of the same name - which passed me by, but on the evidence of this track, I should probably get around to checking it out. Download the track below, and revel in its melody, reminiscent of Ray Parker Jr's seminal 'Ghostbusters' theme. 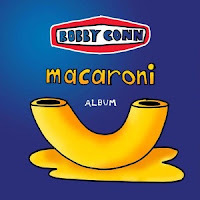 I'm not overly familiar with Bobby Conn's work, and his reputation for concocting elaborate lies is not one that makes me warm to him in the slightest. 'Macaroni' offers forth some of Conn's eccentricities but with a pleasing dash of pop to wash it down. If his back catalogue shares the same quality/qualities then UK folks will be in for a treat as Conn hits up Cardiff (20th June), Brighton (21st), Liverpool (22nd), and London (23rd). Find more info at firerecords.com.